Can your medications adversely affect glaucoma? 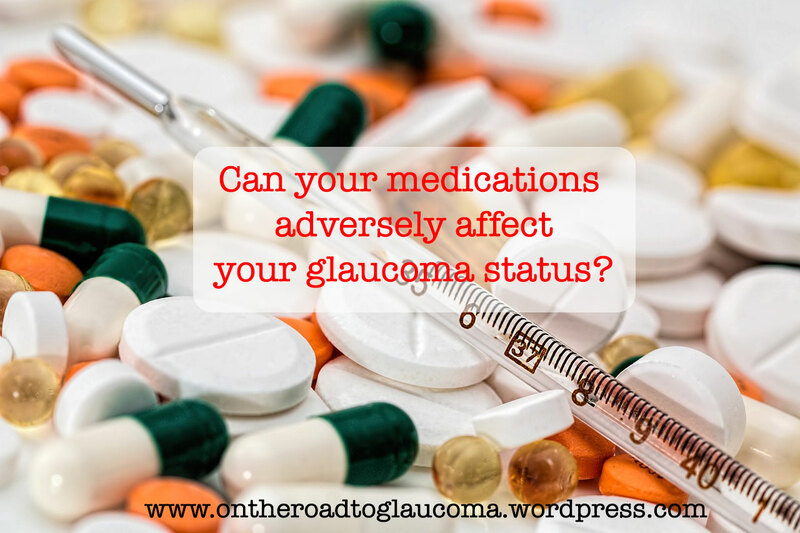 Can your medications adversely affect the effect glaucoma? I need to post what has been happening to me lately before going into this topic. For the past couple of weeks, I have had head pains. These started with my going to the chiropractor for tense, knotted muscles in my neck. He did my back adjustments for my shoulder blade pains and while I was on my back, he adjusted my neck by cracking it. He’d done it before, sometimes with me laying down or sitting on a chair. Afterwards, I felt the neck muscles eased up somewhat but by the time a couple hours passed, I started to feel a soreness to my cervical vertebrae right under the neck. The soreness turned to pain and by the next day, I was having a sensation of pressure to the back of my head. I took pain pills and it did not help. My cervical vertebrae was swollen. I found that funny because it wasn’t hurting prior to the adjustment- only the muscles to my neck. For an entire week, I kept getting the pressure going to my head. My blood pressure raised somewhat. I couldn’t drive nor concentrate too much. When I try to rub the area in my vertebrae, it made the pressure feel increased. My head hurt. I even took naproxen which is for inflammation. I had a hard time sleeping with pressure in my head. A few times, I woke up and had cloudy vision. I had to go back to the chiropractor’s for a BioScan a week after the adjustment. He had a girl who works for him do the scan. It’s basically scanning your pressure points in your hands and feet. I complained about my head hurting. She asked me if I wanted to see the chiropractor. I told her no since I couldn’t afford doing the scan and paying for an adjustment too. I had to return the next morning to get my results from the chiropractor. That visit was free. After his discussion on telling me that I have had some “red” area results which meant that places like my kidneys, liver, bowels, pancreas etc was under a strain. He recommended me using health supplements to help ease up the target areas of straining and overworking. In fact, I just received a call a minute ago about collecting the supplements. I am hoping that these work. I looked them up on Amazon and they actually had good reviews. After his discussion on the results, I told him that I didn’t want any adjustments (so that I wouldn’t have to pay really) but that since he did my neck the previous week, that I was getting those head pressures and pain in the cervical vertebrae. He took a look at my neck and felt for the vertebrae while I was sitting on the chair. He cracked my neck. I felt a little ease up. He said that the bones weren’t moving as they should. I was scared that he’d damaged my neck in some way or dissected a blood vessel that time he had adjusted my neck the week before. Since that last adjustment, I am still getting the head pains. I have an appointment with my doctor for this coming Friday. Thankfully, yesterday I had minor pressure so I basically had a day off from it. Right now, I am feeling my neck muscles feeling tense again. That is usually the first tell tale sign of my head pressure coming. Praying that this goes away. Now with all that said, I do not know if these chiropractic adjustments to my neck and my cloudy vision have anything to do with the worsening of my eyes. I cannot use the computer or read without my glasses now. I have to see my eye doctor in a couple of months so maybe we would find out something. I am using a bunch of medications (for fast heart rate, high cholesterol, asthma) and now have to use supplements as well. I know the supplements are from organic products but I am still concerned that there are ingredients in them that could possibly affect my meds or worse adversely affect glaucoma- in my case increase my suspect stage. That is something I am definitely going to be talking to my doctor about when I see her in a few days. With my suspect stage, I am headed for open angled glaucoma. According to the article on Bright Focus ( Link Here ), your medications would affect your glaucoma in various ways whether you have open angle or closed angle glaucoma.If you are being treated for anxiety, depression, allergies, nausea, muscle spasms, gastrointestinal issues, overactive bladder, asthma etc, you are at risk of increased eye pressure which can further increase the risk of glaucoma. Please be aware of this and talk to your doctor about it. Ask questions. Your eyesight is at stake. I am going to post a follow up of this whenever I get these head pressures taken care of or when my doctor(s) can pinpoint exactly what is causing all these things to happen.